Navigating your way through an unfamiliar city can be challenging and stressful, especially when you’re visually impaired. 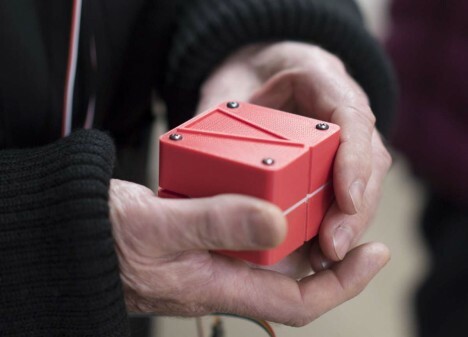 This little handheld device from Yale postdoctorate engineer associate Adam Spiers shifts it shape to point you in the right direction so even if you can’t see, you can get accurate directions to your destination. The current version of Animotus is connected wirelessly to the location sensors on your clothing that work with other sensors mounted on the walls of your surroundings. In the future, it will connect to your smartphone for real-world guidance. It’s a haptic device unlike any other – rather than relying on vibrations like most, you simply hold it in your hand and feel as the top part pivots to lead you. Other sight-impaired assistive devices rely on sound to help navigate, which can be a problem since cities are generally noisy already and hearing their surroundings is a big part of getting around for visually impaired people. Spiers recently supplied the device for an interactive play based on an 1884 book by Edwin A. Abbott called Flatland. Audience members became participants by holding onto an Animotus which led them, in complete darkness, around the “stage,” which was actually the inside of a church. Infrared cameras showed the audience members making their way through the set at speeds nearly as fast as walking in a brightly lit space. At the end of the performance, participants liked the navigation devices so much they wanted to keep them. Spiers says the Animotus is a long way from being produced commercially, but he’s encouraged by the positive response so far. He envisions the device as someday being a simple way for both sighted and visually impaired people to navigate without having to constantly pay attention to a smartphone’s directions.